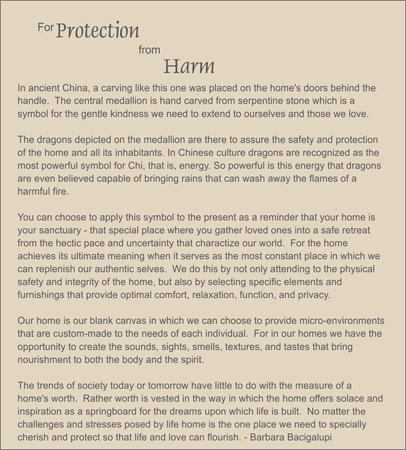 MEDALLION: Marbleized serpentine hand carved medallion depicting double dragons, the most powerful of all mythological creatures whose energy (also called "Chi") could bring the rain to extinguish any fire that might threaten the family and their home. This carving is reminiscent of the ones used as plates behind door handles for a home's front door to protect the family and home from harm. MEDALLION WEIGHT: 450 total carats. ACCENTS: Two geometric carvings of marbleized serpentine and rock quartz crystal beads carved with the ancient Chinese Shou for long life and prosperity. COMMENTS: Place these dragons on the inside of your front door handle to recreate the ancient Chinese tradition.